Traditional or Contemporary, Cutting Edge or Fusion, our award-winning culinary team is here to please. Drexelbrook Catering & Special Event Center’s experienced team of creative chefs are all ServSafe certified and GREAT Kitchens certified for Celiac and gluten-free cooking. We excel at creating custom menus based on seasonal ingredients, always considering your personal tastes and dietary restrictions. Our interactive stations are very popular. Whether cooking on pure Himalayan salt blocks, grills, induction burners, or pouring liquids down a custom ice luge, your options are unlimited. Served, stations, buffets, family-style, or a combination, your dining experience will reflect your personal style and tastes. Flambé, shaken, stirred, and everything in between, your sweet ending offers unlimited possibilities: a cake that says “you”, mini sweets, frozen treats, cordials, and coffee leave a memorable lasting impression. Drexelbrook Catering is proud to partner with the National Foundation for Celiac Awareness (NFCA). Many of our team members hold Certificates of Completion for the GREAT Kitchens (Gluten-free Resource Education Awareness Training) program. Altogether, 24 team members completed the course, including our Managers, Sales Representatives, Lead Servers, and members of our Operations, Culinary, and Beverage teams. 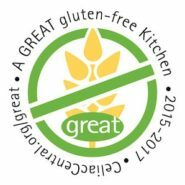 We have provided our guests with delicious Gluten-free menu choices for many years, creating a culture and an awareness of how important the Gluten-free diner is to us. Through proper training, respect, attention to detail, and follow-up, we are confident you will have a wonderful, worry-free dining experience with us. General Menu – A Little Bit Of Everything!